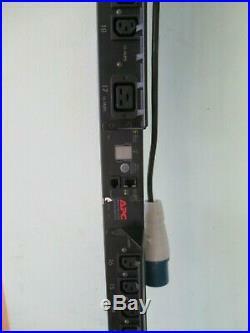 APC AP7954 Rack ZeroU Switched PDU Power Distribution Unit. 16A 230V 21xC13 3xC19. In Full Working Order. 1 x APC AP7954 Rack ZeroU Switched PDU Power Distribution Unit 16A 230V 21xC13 3xC19. Rack PDU, Switched, Zero U, 16A, 230V, (21)C13&(3)C19, IEC309, 10′ Cord. Switched Rack Power Distribution Units (PDUs) provide advanced load monitoring combined with remote on/off switching control of individual outlets for power cycling, delayed power sequencing, and outlet use management. Switched Rack PDU Features & Benefits. Local Current Monitoring Display. The aggregate current draw per power distribution unit is displayed on the unit via a digital display. The local digital display helps installers avoid overloaded circuits by providing a visible warning when the current draw is close to the maximum amperage draw of the strip. Define alarm thresholds in order to avoid overloaded circuits. Network and visual alarms inform the user of possible problems. Remote Individual Outlet Control. Remotely manage outlets so users can turn outlets off that are not in use (prevent overloads) or recycle power to locked-up equipment (minimize costly downtime and avoid travel time to equipment). Allows users to configure the sequence in which power is turned on or off for each outlet. This helps avoid in-rushes at start-up, which can cause overloaded circuits and dropped loads. Sequencing also allows users to predetermine which piece of equipment is turned on first so other equipment dependant on that unit will function properly. Full-featured network management interfaces that provide standards-based management via Web, SNMP, and Telnet. Allows users to access, configure, and manage units from remote locations to save valuable time. Associated with this feature is the ability to quickly and easily upgrade the firmware via network download to installed units for future product enhancements. Includes horizontal, vertical, and toolless-mount varieties. Puts power where it is needed most – in the racks near the equipment. Wide range of input and output connections. Product family includes a variety of input and output connections to distribute 120V, 208V, or 230V power to multiple outlets. Having a variety of inputs and outputs allow users to adapt to varying power requirements. APC offers units that bring up to 14.4kW using a single branch whip. Single input power source. Supply power from one branch whip to multiple pieces of equipment, conveniently powering rack-mount equipment. Supports up to four access levels – Administrator, Device User, Read-Only User and Network-only User – with user name and password requirements. 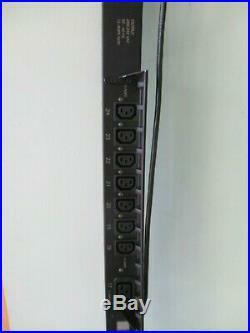 The aggregate current draw per rack PDU is displayed on the unit via a digital display. (Available on designated SKUs only). Note: Only available on units with the current monitoring capabilities. Please see SKU specifications for availability. Allows users to access, configure, and manage rack PDUs from remote locations to save valuable time. Integrates with StruxureWare Data Center Expert. An IT-ready, scalable access monitoring system that collects, organizes, and distributes critical alerts, surveillance video and key information, providing a unified view of complex physical infrastructure environments from anywhere on the network. Allows four rack PDUs to be connected using In and Out ports so that only one network connection is necessary. Quickly and easily upgrade firmware via network download for future product enhancements. Eliminates the need to replace products already installed in the field when new features are released. Nominal Output Voltage: 230V. Maximum Total Current Draw: 16. (21) IEC 320 C13 (Battery Backup). (3) IEC 320 C19 (Battery Backup). Nominal Input Voltage: 200V, 208V, 230V. Input frequency: 50 – 60 Hz. Input Connections: IEC 309 16A 2P+E. Cord Length: 0.9meters. Acceptable Input Voltage: 220-240VAC. Number of Power Cords: 1. Maximum Input Current: 16A. Maximum Height: 1619mm, 161.9CM. Maximum Width: 56mm, 5.6CM. Maximum Depth: 44mm, 4.4CM. Net Weight: 5.91KG. Operating Temperature: -5 – 45 °C. Operating Relative Humidity: 5 – 95 %. Storage Temperature: -25 – 65 °C. Storage Relative Humidity: 5 – 95 %. VAT IS NOT PAYABLE BY PURCHASERS OUTSIDE THE European Union (EU) AND by. Purchasers in the EU (excluding UK) who are VAT registered. TH 211830 211831 211832 211833 211834 211835 211836. The item “APC AP7951 Rack ZeroU Switched PDU Power Distribution Unit 16A 230V 21xC13 3xC19″ is in sale since Saturday, March 2, 2019. This item is in the category “Computers/Tablets & Networking\Power Protection, Distribution\Power Distribution Units”. The seller is “itinstock” and is located in North London. This item can be shipped worldwide.